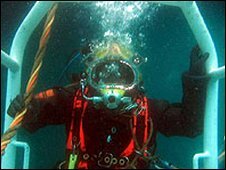 A team of Cornish divers accused of plundering a shipwreck off the Spanish coast are to face trial in Spain. Peter Devlin, from Falmouth, Malcolm Cubin, from Truro, and Steve Russ, from Helston, are accused of taking gold and diamonds from the wreck in June 2002. They say they were diving for tin ingots from a nearby wreck, for which they had a contract. The men, who all deny a charge of theft, are due to appear for trial at the Court of Santiago on 24 March. The men are each charged with one count of theft. They also each face a further charge of destruction of the patrimonial heritage of Spain, which they also deny. The trio said they were working as divers on a salvage contract awarded by the Spanish government when they were arrested. If they are found guilty, the men each face up to six years in jail.